US Dollar Outlook for Q4 and an Important Lesson for Traders to Keep in Mind - by Alpesh B. Patel. The currency markets globally have been hit by several key developments that have changed investors' outlooks for the coming months. The most important asset to keep an eye on is the United States Dollar, the most heavily traded instrument as it is a component in all major currency pairs and acts as the global depositary currency. What will Dollar do in the months to come and how will it affect the rest of the market? Read below to find out. 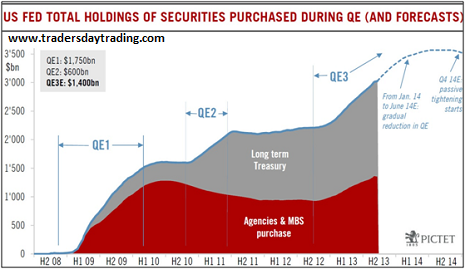 In the United States, the theme that was discussed all summer long was the awaited 'tapering' of Fed's asset purchases program. To shed some light into this matter we need to take a moment and explain what is this 'asset purchases program' that everyone keeps talking about. So here it is in layman's terms: to better assist the US economy to recover from the global financial crisis it goes through the United States Federal Reserve Bank, the country's central bank, is buying every month some 85 billion dollars in financial assets like treasury notes and mortgage-backed securities from its member banks. This adds liquidity to the system and assists the banks to offer loans and credit to the everyday person. So, during the summer it was believed that given the developments the US economy showed for some time the Fed was going to start reducing or 'tapering' this program and analysts thought that a 5-10 billion dollars reduction was certain. However, the Federal Reserve Bank surprised everyone that shared this belief and went ahead to leave its current level of purchases intact leading the Dollar to a massive sell-off. Now, if you add to this disappointment the very recent stalemate the US government was brought to by the lack of common ground between Democrats and Republicans on raising the country's debt ceiling that kept key government sectors close for two weeks and almost drove the US on defaulting on its debt you will quickly assess that the Dollar's outlook is not favorable. I believe that the coming months will be a struggle for the American currency, the economy seems to be recovering but not as fast as the Fed would like and the recent nomination of Janet Yellen to succeed Ben Bernanke is an actual signal that this is true. Yellen, the current vice-chairwoman of the Federal Reserve is a known dove and her appointment seems a sign that the country's economy will need added stimulus for some time. In the coming months we will find out how much did the recent shutdown in government sectors hurt the US GDP as analysts cite that the impact could be meaningful. Standard & Poor's recently estimated that the impasse could have shaved off as much as 0,6% from the annual GDP output. Also, keep in mind that the deal made between Democrats and Republicans over raising the debt ceiling is not a permanent one. 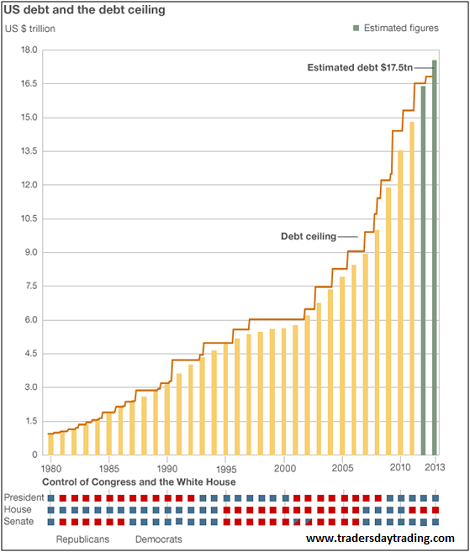 They only agreed on funding the federal government until January 2014 and it is estimated that the American economy will now re-hit the debt ceiling in early February. This translates to a turbulent Q4 for the US currency as the debate over this matter could start destabilizing markets weeks in advance and over the same period time for Fed's tapering decision will be running out. If the Reserve Bank sees improvements made in the US economy in the next couple of months they could move for tapering as soon as late 2013 or early 2014 but with the shutdown impact on GDP not yet fully assessed and the looming uncertainty over the debt ceiling around the corner this scenario doesn't seem very likely. Lesson to be learned: Never put all your eggs in one basket. Almost every analyst and investor in the world had their mouth and money put on the almost 'certain bet' of the year: Fed tapering purchases and Dollar rising sharply. However, markets will always hold surprises and if you bet heavily on such events it will come a time when you'll lose and probably wipe out a significant part of your portfolio. You need to treat every trade that you make as a small step towards success and understand that investing is not a fast track to wealth but rather a slow steady climb.